I have not posted a training update in over a week. During week 9 (2 weeks ago) I had two of my best workouts so far, and since then I’ve been unable to even walk without a limp due to pain in my right leg. It started out as some mild soreness early in week 9, and then just magnified dramatically after Saturday’s run. I have not been able to schedule an Ortho appointment yet due to my recent travel, so not sure what is going on or what the future holds. At this point I would say St. George is very much in doubt. This has been a tough running week! I’ve had bigger mileage weeks in the past, but my legs have never felt like this before. They don’t feel injured, just completely exhausted. The “cumulative fatigue” from the Hansons Advanced Plan is in FULL EFFECT!! I haven’t been able to post any this week, so I’m just going to focus on the SOS (Something of Substance) runs on Tuesday (Long), Thursday (Speed), and Saturday (Tempo). After an 8-mile easy run on Monday with Nathan and Brian, I met them again for my scheduled 14-mile “Long” run at the Edwin Warner Nature Center at 5am. I was expecting cooler temperatures with lower humidity on Tuesday morning, but it was still 77º with high humidity and dew point. There was a cold-front approaching, but it did not arrive until around 7:30am (bummer). I decided to relax my Long run pace goals (8:05 to 8:25 per mile), since hitting this range consistently in high temps and humidity is just not feasible. 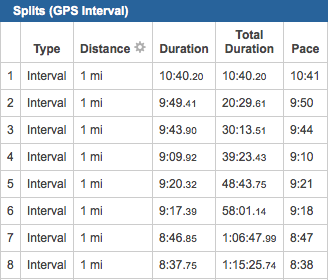 I told Brian and Nathan that I really just wanted our overall average to be less than 9:30 per mile for the run. From the very beginning of our run we kept encountering large swarms of GNATS!! I guess they were stirred up with the high humidity and approaching cold front. I was wearing a bright yellow singlet, and it was mostly black from the gnats by the end of the run. I also ended up with more than I like to think about in my mouth which is disgusting. Anyway, we started off with a 6.25-mile loop in the park and then grabbed some fluids back at the cars. The heat and humidity were tough, but my legs felt fairly decent. Brian had to head out after the first loop, so Nathan and I did a 4-mile out-and-back into the surrounding neighborhood, and my legs continued to feel really good, and the pace continued to get quicker. STG Training – Week 7: 50 Miles….DONE! On Thursday I met the JSRC track group at 6pm at Vanderbilt to complete my weekly “speed” workout. 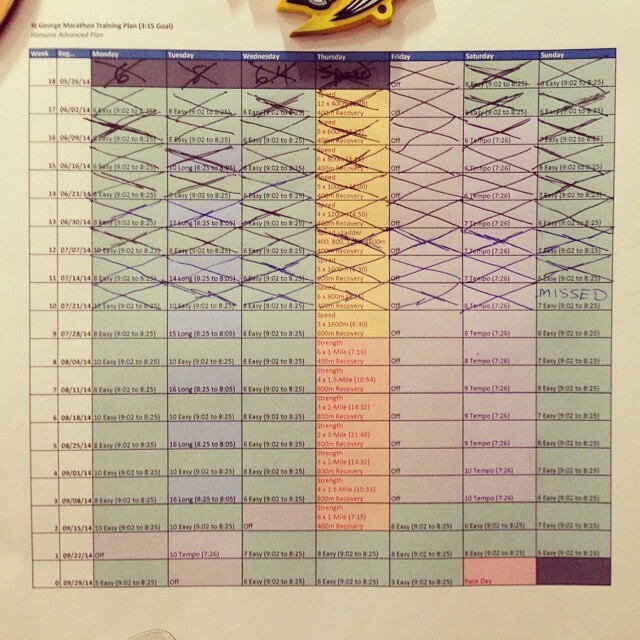 I did the week 6 “speed” workout prescribed in the Hansons Advanced Training Plan. This was the first “speed” workout with more than 3-miles of intervals. It was a ladder that consisted of 400m / 800m / 1200m / 1600m / 1200m / 800m / 400m with 400m recovery in-between each interval. This equates to 4-miles of intervals and 1.75-miles of recovery. While the humidity was down a touch from normal, then temps were hovering around 90º at the start time for the workout, which made this workout a BEAST! STG Training – Week 7: The Volume is Intense….But Not Quite Up to 11 Yet! This week started out with a 10-miler on Monday, an 8-miler on Tuesday, and a 6-miler Wednesday. This volume of mileage is INTENSE with the Hansons Advance Plan, but is nowhere near what it is going to be in a few weeks when it gets cranked all the way up to 11 (Next week is 8, 14, 7)!!! 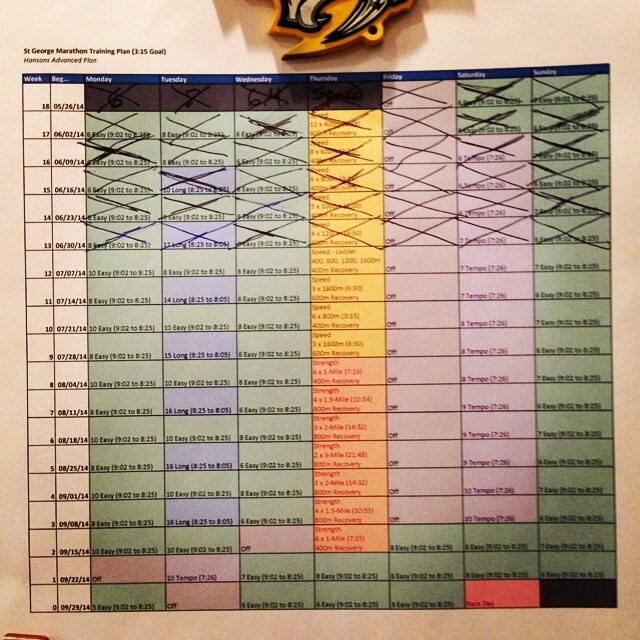 On Thursday I met the JSRC track group at 6pm at Vanderbilt to complete my weekly “speed” workout. 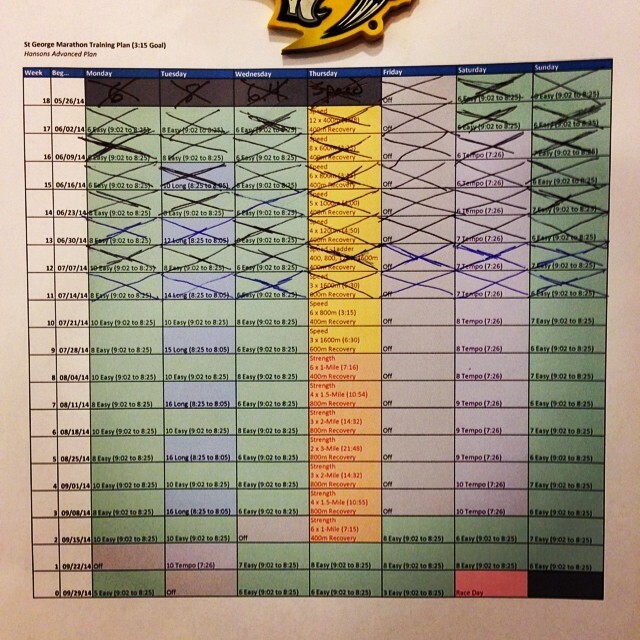 I did the week 5 “speed” workout prescribed in the Hansons Advanced Training Plan. This was 4 x 1200m with 400m recovery in-between each interval. This equates to 3-miles of intervals and 1-mile of recovery. 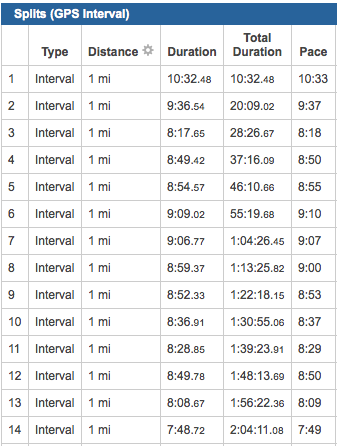 Based on my goal marathon time of 3:15, the target splits for this workout are 4:50. We caught a huge break with the weather Thursday night. The temps were around 79º with a nice break in the humidity. This felt awesome compared with previous weeks. 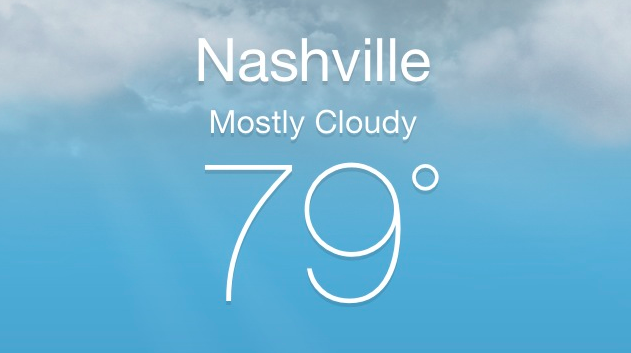 Hard to believe it could be 79º at 6pm on any night in July! 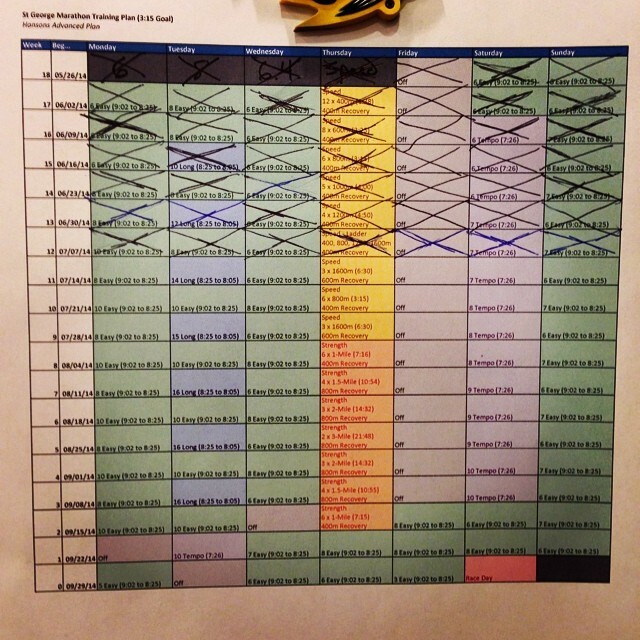 While Monday was the first day of week 6, it also marked the end of my first full month of training for the 2014 St. George Marathon. As for the run itself, Nathan, Brian, and I did a relatively chill-paced 8-miler on the Harpeth River Greenway, starting at the Morton Mill parking lot. The heat and humidity continued to be nasty, even at 5am! I guess this is going to be the way of things until mid-September.